Asher Zaczepinski of the Starfish goes for one of his 18 steals on the weekend as Alex Ma of the Surf tries to avoid that fate. Two up with three to play. It’s a good place to be in any sport: two games ahead of the competition with just three games left. If you keep winning, you are league champs, or if the other guy slips just once and you’ll get the same result. 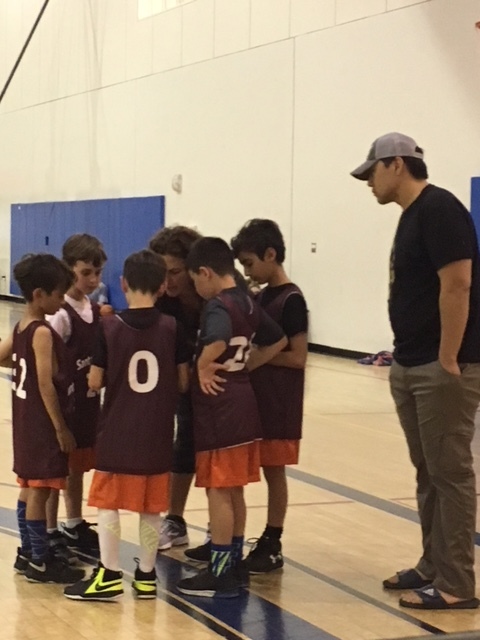 The Bantam League Sol are in that enviable spot already having won each of the first two in-season tournaments in the Santa Monica YMCA Spring 2018 youth basketball league. They can’t clinch a tie for the title for another ten days from this publishing date, as the Bantams have this weekend off, but when they do play next, they will meet the cellar dwellers—and that’s reward for being on top through 6 games out of a 9 game season. The Major League Purple Aces can equal that spot if they can tame the Royals for a second straight time in a tournament final in that division this coming Saturday night in the feature game of the weekend at 6:40 p.m. If they succeed there, the can clinch a tie for the championship a day later if they were to defeat whichever of two teams might be the #8 seed in the final tournament. And the Minor Oaks can do those two aforementioned teams one better, and clinch a tie for their league title if they get past the Pines in the Minor’s tourney final on Saturday at 12:50 in the afternoon. That would give the Oaks a three game lead over possibly two other teams, with just three games left in the season, and make it nearly impossible to be caught. Coach Kerri Keslow instructs the Bantam Surf in their tournament semi final game last Saturday as concerned Coach Michael Ma looks on. On Saturday, the division played its consolation and championship semi finals of tournament #2 (of 3). — The Sol stayed on course moving their record to 5-0, using their usual second half spurt to quash any hopes of a Sealions comeback, winning 22-12. Jace O’Brien scored 4 in each half for a game high total of 8 points in the win. The two teams seemed to be figuring each other out through the first two quarters, leaving the floor tied at the half at 7-all. It was still tight through three, when the key sequence in the game happened. With the Sol leading by only two at 9-7, the Sealions’ Mohamad Jahromi had a shot from the middle of the lane go in and out, and on the ensuing possession, Eliot Mamedov of the Sol threw in a wild off-balance fling that found its home with 5:07 to play, drawing a collective “ouch!” from the Lions. It was a four-point swing, and it broke the spirit of the game. All doubts were cast aside a moment later, as coming out a timeout, Noah McLaurin found O’Brien alone underneath his own basket and scored to make it 13-7. The taller Sol dominated the glass, winning the rebound war 33-19. T.J. Turner played well for the Lions scoring 5 with 8 rebounds and 5 steals. The game was played in front of the largest crowd of the day with 34 spectators watching closely. –The Starfish qualified for the championship game again, setting up a rematch of the first tournament, beating the Surf with a 4-0 fourth quarter run, 20-16, in front of a crowd half the size of game one of the evening doubleheader. It looked like it might be a tough night for the Starfish with leading scorer and player Marko Zelenovic held out of the game on a coach’s decision. It was a slower paced game that the first semi final to be sure, but when Macy Zelenovic hit both half time free throws, it put the Stars up 8-6. Leo Mooney hit Felix Idell with a dangerous but effective cross court pass, which he finished off with a lay-in to tie the score with 5:50 to go in the third quarter. Ben Steelman put the Stars back up by a deuce on the next trip down, hitting from the left side. Right before the third quarter sub break, Weston Keslow tossed one in from the left wing to knot things up again, this time at 10-all. 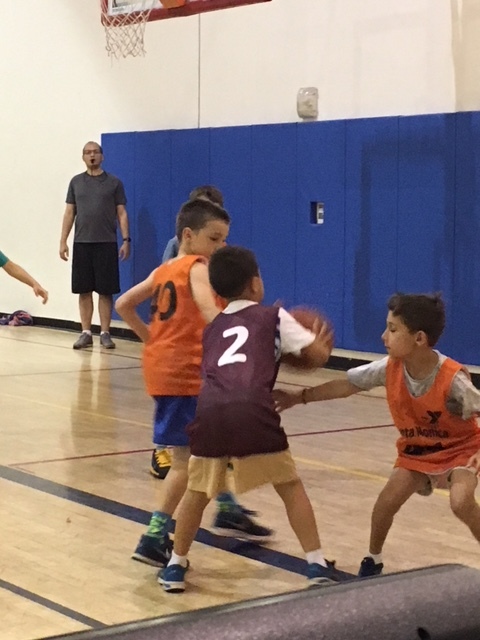 Asher Zaczepinski, who had a super effort defensively with 11 steals, scored his only basket of the night from 12 feet out on the left side to put the Starfish ahead 12-10 with 1:11 to go in the third. In the fourth, baskets by Macy Z. and Atobek Nasimov, who led both teams in scoring with 6, nailed down the win for the Starfish. Ari candela played a fine game, grabbing 11 rebounds in a very active outing, and he also scored a bucket in the second period. Gavin Bao had 9 rebounds. Joseph Zak and Mooney were the standouts for the Surf, and Sean Saunders played well. Only 17 fans bothered to come and watch. –The consolation Semi finals were played on Saturday morning. In the first, The Sailfish nipped the Sun 12-10 in front of paltry crowd of 11. There were more players than fans! Yikes! The number did “swell” all the way to 19 by game’s end. The Sailfish had an 8-2 lead early in the second quarter before Rowan Booher hit back to back baskets to make it 8-6 by halftime. A full 6 minutes after his most recent, he tied the game with a drive to mid-lane and a shot that swished through with 6:08 to go in the third period. Ronan Hill of the Sailfish dribbled in from the wing, went under and through the key, popped out on the other side and drilled a baseline turnaround to give them the lead back at 10-8, and a moment later Max Baracy hit a rebound follow up to up the advantage to 12-8. Cassius Taylor’s lay up with 0:15 remaining before the end of the quarter made it a 12-10 game. From there on in, nothing dropped despite both teams having chances in the final frame. Booher ended up with 8 points, Baracy with a dozen rebounds in the way of statistical highlights. — The Sharks are the only team now without a victory (they do have two ties) as they fell in the other conso semi final, 22-18 to the Seagulls. It didn’t look that way at first, as the Sharks out to an 8-2 first quarter lead with four different players scoring baskets, but they were outscored 7-0 in the second period to fall behind by one at halftime. Amelia Morovich-Hess, one of the first quarter scorers, put the Sharks back in front through three quarters with the only points for either team in the third. In the fourth, Sammy Levi used a nice screen by Luke Hill to lose his defender and sunk a shot from 10 feet out on the left wing to give the Gulls the lead 11-10 on the first try of the final period. The Owen Roberts hit a 16-foot bomb from the left baseline to make it 13-10, and Levi’s free throw line jumper put the Sharks in trouble, down 5. James Cook brought them back to within three with plenty of time left on a shot from the left elbow, but after a scramble for a loose ball, Archer Aguilar came up with it and fired one home to make it 17-12. Even though Monika Diaz scored a bit later, it wasn’t enough for the Sharks. All tolled, 6 players scored 4 or more points when you combine both teams. The Sharks were without Ryan Chambers, Josie Casa and Benny Arroyo, three good players who can make a difference for them. It’s not easy to win without all your players there. Sunday was closing day for the second tournament on a Busy Bantam Weekend. — The championship tilt went to the Sol, who played tough defense in beating the Starfish 10-3 in the regulation time game. It was just 4-1 at half time, but as they have always done this season, they wore down their opponents just enough to take the cake. Keep in mind that Nasimov and the tallest of the Starfish Macy Z. missed this one, and against a tall team, that might have mattered. The Starfish, to their credit, played some outstanding defense as well, but just couldn’t get enough good looks at the basket against the taller Sol. It was 2-0 Sol until Antonio Rodriguez hit from the left baseline on the Sol’s signature inbounds play. Noah McLaurin to this point had assists on both baskets. Danilo Samardzija hit from the left side of the lane to break the game open, it seemed, at 6-1 in the third quarter. The first Fish bucket finally came from Zaczepinski (another 7 steals today) to make it a 6-3 game with a minute and a half left in quarter number three. Mamedov’s rebound follow up made it 8-3 just before the quarter ended. In the fourth, down 5, the Starfish resorted to trying to cut the lead down via the three point shot, but were unsuccessful in doing so and were shutout for the quarter. Mark Zelenovic grabbed 9 rebounds for the runners up. Ben Felson deserves mention for his good play for the champs. –The third place tilt belonged to the Surf, 13-11 over the Sealions. Again Turner did the bulk of the work for the Lions, scoring 5 with 7 rebounds. Late in the fourth, with the game on the line, Mooney hit a right baseline drive in to make it 10-8 Surf with 3:27 remaining in the game. Cooper Kun tied it up for the Lions with 3:06 to go, and the Surf called timeout. Mooney hit an up and under wraparound out of the timeout with 2:59 to go, and that proved to be the game winner. — The Consolation final went to nobody! It ended up being a 15-15 tie. A key moment in the game happened as the halftime horn went off: Ronan Hill dropped in a three pointer off of a pass from Asher Eng to draw the Fish to within one point, trailing 10-9. Opening the third, Dagmawi Ayele hit first, then Archer Aguilar, after having his shot blocked by Eng, stayed with it and scored to make it 14-9. But Hill’s back-to-back baskets made it a one-point game in the first minute of the fourth and final quarter. At the 4:09 mark, Max Lewis scored his second basket of the game to put the Fish back up one at 15-14, the first Sailfish lead of the game. It took Levi’s post game free throw, one of two, to tie the game. Hill was best for both teams with 9 points, 7 rebounds and 3 blocked shots. Ayele was high-point man for the Gulls with half a dozen to go with double that many rebounds. You do the math. Luke Hill and Roberts played well as did Marina Shickler for the S-Fish. — The Sun ran up a big lead and beat the Sharks in the 7th place game 14-11. It was 12-1 at halftime. Justin Tun led all scorers with 10 in the win, to go with 11 rebounds for the double double. Taylor was good again. Trajan Booker played well for the Sharks who got a massive 12 rebounds from Liam Mulholland. The Rooks finished up tournament #2 with a set of four games on Saturday afternoon. — The Gorillas played solid defense and scored just enough to beat the Rocks in the title game 15-13 (8-6 in regulation time). Both of these teams play a fundamentally sound brand of basketball, especially when you take their ages into consideration. There are not a lot of mistakes, and both play very patient offenses to go with their solid defenses. The Rocks could not find the bottom of the net, despite getting pretty good looks when they did shoot, it was just one of those days. For the Gorillas, it was Elliot Ma running the show. When he scored his third and final basket of the late afternoon, it gave the Gorillas an 8-2 lead with 6 minutes to play in the third quarter, and would turn out to be the game winning shot, despite the Rock’s best efforts thereafter. Sylvie Levitt had a rebound fall into her arms in the middle of the key and wisely gave it up to Amir Enayati who scored for the Rocks to make it 8-4. Enayati grabbed a loose ball and went in to try and score but missed. He kept at it and scored on the second effort and it was 8-6 with 1:26 to go in the third, and we had a game on our hands. Oddly enough, that was it for the scoring, although as said before, there were plenty of chances, but the basketball gods deemed that the goals be closed for the rest of the day. Ma ended with 12 rebounds, and teammate Naoah Hagooli-Bolanos added 9 more. Jenson Montague scored the winner’s other basket n the second quarter, a big deal when you win by two! Henry Brown and Wally Levitt played good games in the frustrating defeat. — The Crusaders are still the team to beat in the overall standings after posting a 22-19 win in the tournament 3rd place game over the Banana Slugs. This one was full of intensity from the coaches and players right on down to the fans on the benches. Both of these needed a win to stay in the race for the league title. The Crusaders were simply the better shooting team in the first half and played equally well on defense in building up a 10-5 lead. Iwa Hashim kept the Sluggos in the game with 6 third quarter points, but the Crusaders were up to the challenge and scored 6 of their own, including Aiden Harvey’s clutch shot with 1:38 left in the period to make it 16-11 in favor of the Crusaders. Only three point total for both teams combined were scored in a tension filled fourth. Gavin O’Brien was player of the game for the Crusaders, scoring 8 with a like number of rebounds. Hashim finished with 8 for the Slugs, missing a double-double by two boards, while Michael Mikhal had 14 rebs and Miles Franklin another ten on top of that. — The Consolation final went to the Moose, 15-13 over the Koalas. Ryan Cohen’s buzzer beater at the end of the first quarter gave the Koalas a 4-2 lead. Back to back baskets by Ben Steelman gave the pull the Moose to within two points with a minute to go in the third quarter, trailing 8-6. In the fourth, Taylor Moore came alive to save the day for the Moose, who were without standout Desi Parra for this one. First he hit a turnaround against some tight defense to tie the score at 8-8 a minute in, then knocked one down from the left elbow at the 4:36 mark to give his squad the lead. Just after the final sub break, his steal and lay in made it 12-8. Ethan Pages finished the scoring run with a put back, his first basket this year in 18 games, and ladies and gentleman, his first ever at the Y in this his 5th season, and 33rd game played. YES!!!!! Did his basket matter in the game result. Um, yes, his team won by …..two points! A note here, he also hit one of two in-game free throws for a career high 3 points, and had a nice looking 7 rebounds to go with it. Cohen of the Koalas, Luke Steelman and Moore all ended up with 6 points. Steelman also had 8 rebounds and 4 steals in a nice all round game. Victoria McNary scored 4 with 9 boards for team K.
— Break up the Anteaters! They finally got on the winning side of things, using a spectacular 11-point/12-rebound outburst from Samo Y player of the week Erol Besincioglu to outlast the Fighting Artichokes in the 7th place game, 19-16. Besincioglu did not even show up until the second quarter was starting, so it could have been even more. His effort offset that of Vihaan Nawathe and Vaughn Elliot who scored all 16 of the Arties points split right down the middle. Erol’s first basket tied the game at 2 the first time he touched the ball in the second quarter. Alan Larkin’s rebound follow up put the Artichokes back on top at the second quarter sub break. Besoncioglu and Elliott swapped baskets to keep things even at half time. In the third quarter, Dylan Kravitz (4 points/7 rebounds/4 steals and 4 blocked shots) scored inside off of a pass from E.B. to give the Anteaters a 10-6 lead, and they started to dream of a first win. Tiam Baraghoush helped make that dream a reality with a five-foot shot from the left baseline with 3:09 to play in the third. The Anteaters were running away with a 12-6 lead. But here came the Artichokes. Nawathe from Jonathan Watson with 2:15 to go in the third and it was 12-8. It looked like comeback time. But Erol hit again — he can’t miss and it’s 14-8 with 1:48 left in the third. Nawathe scores again off of a feed from Axel Trussler and we have a game — as it is 14-10 through three. In the fourth, Elliott misses once and twice from the free throws line on successive trips, but hits the third time down to make it a one-possession game. But it’s Besincioglu to the rescue. Every time the Arties make a push, he has the answer, and it’s Erol time again making it 16-12. But there’s Elliott again to pull his team to back to within two as he hits again from the free throw line. Kravitz looks like he walked en route to a score to put the Ants up four again, before Nwathe make it a two point game at the end. The Anteaters added a meaningless free throw afterwards. Nawathe had 12 rebounds; Elliott 6 steals for the F.A. Keeping in mind the Anteaters were without one of their best in James Petrovich, what a nice high quality game for a Rookie League 7th place affair. There were two games to round out the schedule in non-tournament action for these four teams on Sunday morning. — The Sycamores had just enough to thwart the Orangels 22-18 in the first. One big moment came with 2:00 left in the third quarter when an Orangels player missed two in-tight shots and on the next possession the Sycamores Joe Farzam missed his first but made his second and it become 15-10 for the Sycs. With 5:26 to go in the final quarter, London Coleman buried a shot from the free throw line with Miles Aguilar garnering assist honors and it was 17-16, but those were the Orangels final points of regulation time. Jayson Badua and Farzam were best in the win; Sherwin Shahrabi played well in defeat. — The Oaks perfect record is still intact, if only barely. But then, barely is plenty good enough….at least for now. They topped the Elms 21-20 in regulation time. With the Elms down 17-10 and in trouble entering the fourth quarter, Travis Waters put down a three pointer. But Nathan Kashper hit on the next trip to put it back up to a 6-point lead for the Oaks 19-13. Arjun McIntosh, who had a fine game with 8 points and 8 rebounds in the loss, scored twice in a row and all of a sudden, there was hope for the Elms, down 19-17. But there was Kashper again with a layup after a steal by Nehemiah Misfen in the back court and it was 2-17. Three late free throws from Dean Phelan made it closer. Jacob Burrows and Alex Brick each scored 6 in the win. For Brick, he also had double figures in rebounding. Kenneth Kun played a nice over all game before fouling out early in the fourth quarter for the winners. The Big Leaguers played their two consolation games out at the end of tournament two on Sunday night to wrap up up the full, 16-game weekend. — The Goldrush and Big Red could not decide things after a full 32 minutes, settling for a 22-22 tie. Coming out of the final sub break, Gaspar Antal (11 rebounds) found Bruno Bernacchi inside for a 15-14 GR lead, but Brayden Stoll fed Joey Little on the right baseline who drive and flung one over the outstretched arms of the tall Antal, and on the beautiful floater the Big Red were back in front with 1:58 to play. From there it would be a frantic finish. Bruno Picazo scored over Estevan Rodriguez, who was held well under his season average by scoring only 6 in this one (he did have 9 rebounds) to put the Rush back up a point. With ten seconds left, it looked very much like Little would be the hero of the day, as he hit a three pointer from deep in the right corner to give the Big Red an 19-17 advantage. But Antal calmly hit both of his post-game free throws, the only ones in play for either team and it ended up a draw. Little finished with 7. Quest Miller had 4 and 6 boards and played a good game for the Red. — The Blues, playing without star Michael Hill, pulled off a mild surprise in the consolation final, topping the Yellowjackets 33-27. The Jackets did not shoot well early, and later made poor shot choices a habit. Not great team passing either and those kids of things will do you in at the end like they did her. Nick Arjomand took home player of the game honors for his 10 point performance for the Blues, who held a 12 rebound advantage overall thanks to a dozen of those from Sebastian Ramirez. Charlie Downey looked comfortable in scoring 5 including a three point success. Timosha Moncher scored 8 to lead the Jackets, who did carry an 8 steal advantage for the game, but their defensive efforts did not pay off often enough. This week the Minor league second tournament final pops up first on Saturday betwixt the Oaks and Pines at 12:50 p.m. The Purple Aces and Royals renew their budding rivalry in the Major tourney championship game at 3:10, and then one of the highlights of any season as we close the day with the seasonal Parents vs Kids games in the three lower divisions. We do not play a Major game of this sort as it has been historically poorly attended to the point where it is not worth wasting our time putting it on. Sunday will kick off the third and final tournament in the Rookie and Major Leagues, with both tournaments being seeded by standings after two rounds. –If you have any problems, please take them to your coach, and if you are not satisfied with your coaches reply, bring the issue to me. RULE UPDATED (2-18-18): In the Rookie and Bantam league, beginning a few seasons ago, players making a three point shot could then be guarded by one defensive player at a time outside of the three point line. This rule, known as the “Dalton White” rule, has been amended to include the even the time said player does not have the ball, HOWEVER, the defender may also now steal any pass intended for that player outside the three point line, the same as used to be the case inside the line. In no case may the defender go past the half court line, and since there is no back-court violation, a pass to the offensive player behind the three point line is safe and acceptable. **If your child is injured, please resist the urge to rush onto the court to take care of them (unless it’s obvious that it is serious). 95% of the time, if you give them 30-60 seconds, they are just fine, and continue in the game. Sometimes they have to go to the bench for a brief bit to recuperate. Let them work it out themselves as much as you can. The refs will handle it first, then the coaches, then you and me.